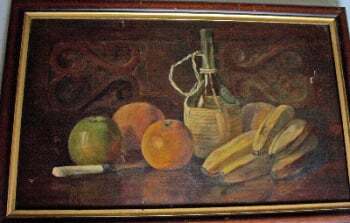 Still-Life - Paintings for sale, Vintage Books for sale, Ranchi Art & Antiquarian Books' Shop. 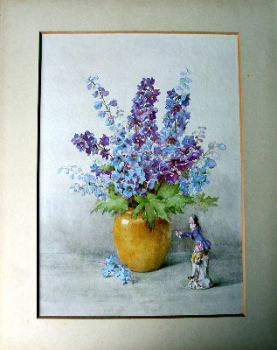 Delphinium and Meissen, open edition print. c1960. 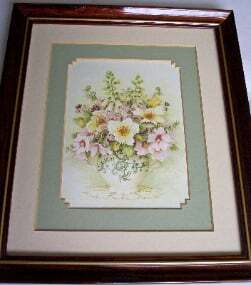 FLOWERS DISPLAY, UNKNOWN ARTIST, FRAMED AND GLAZED c1970's. Geraniums on doorstep in Spain, watercolour on paper, signed Doris Petter, c1975. Unglazed frame. Herrings, Still-life study, oil on board. Signed and dated verso Joan Fuller November 1971. Unframed. 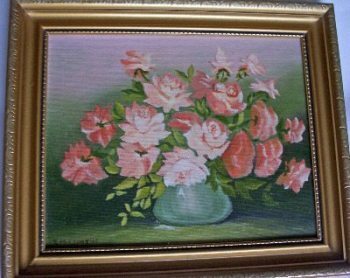 Miniature Roses, still-life study in oil on board, signed E.M. Lyons dated 1985. Poppy Jungle, mixed media, watercolour & acrylic, signed monogram symbol, c1960. 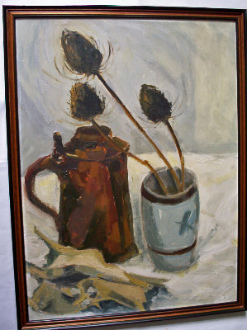 Still life study of stein, poulet roti and dried flowers, oil on board c1980. SOLD. Still-Life study of a Lemon, oil on board, unsigned (Joan Fuller) c1970. Unframed. Still-life study of a Teapot on Tablecloth, acrylic on board, signed Christine and verso Christine Pallett 2014. Still-life study of Coleus in Pot, oil on board, signed verso RB Fuller September 1976. Framed. 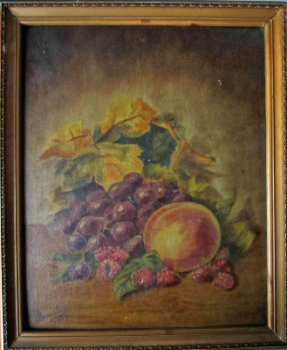 Still-life study of cut blackberry vine, oil on panel, unsigned. c1900. SOLD. Still-life study of fruit and flowers on a table by G.W. Harris 1908. Still-life study of fruit and wine, signed monogram I.A.F. 1904. Still-life study of fruit on a table, oil on panel, signed J. Beveridge, 1917. 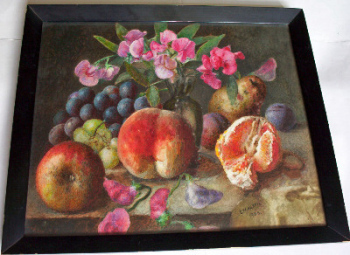 Still-Life study of Fruit, oil on canvas, signed E. Ladell and verso Ellen Ladell. Framed. c1880. SOLD 13.01.2014. Still-Life study of Michaelmas Daisies in Bowl, impasto oil on canvas, signed Alice, c1980. 20thC British School. Still-life study of Nectarines, watercolour on paper, signed P. Jeannotte, c1975. Framed. 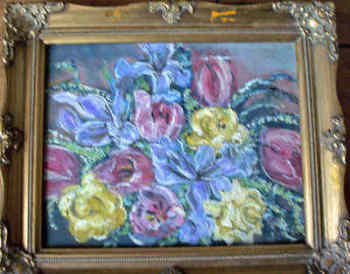 Still-Life Study of Potentillas, oil on board, signed Taplin. c1960. Study of Gladioli, watercolour on paper, signed initials AM and Alison Marshall verso. Framed. c1980.